With the rising temperature in Singapore, air-conditioners have been widely installed in many areas to fight off the hot weather. You can see air-conditioner almost everywhere you go, such as shopping mall, office, house, cafe, canteen and many more. 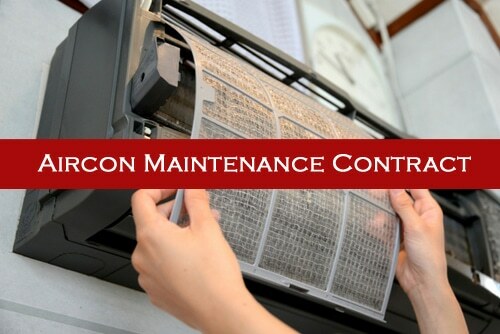 With the high usage of aircon in Singapore, aircon maintenance contract is essential in maintaining the condition of your units. Without proper maintenance and servicing, your units will be prone to breakdowns which you definitely will not want to encounter. With years of experience in the aircon maintenance industry, we are able to offer attractive and reliable aircon servicing contract in Singapore. We provide maintenance to wide range of clients such as households, office, warehouse, factory, cafe, childcare, school and many more. With our regular maintenance servicing, we will keep your air-conditioner cool and clean, allowing you to enjoy the fresh and clean air in your home or office. There are many benefits in our aircon maintenance contract. The main benefit is that it gives you a piece of mind where you do not have to worry about your air-conditioning system while you and your family is able to enjoy the cool and clean air. There are also other benefits such as improve airflow, improve operating and cooling efficiency, reduce energy consumption, reduce possibility of system breakdowns and extend lifespan of your unit. We should see air-conditioner as an investment, with proper maintenance and care, it will last longer which will make our assets and investments worth in the future. We provide aircon maintenance servicing contract to all residential, commercial and industrial premises. Our staff are all trained in different air-conditioning brands and types of units. Thus, your air-conditioner is in good hand where our staff is able to maintain and service your units safely and professionally. Without regular maintenance servicing, your air-conditioner is at the risk of facing aircon problems such as water leaking, aircon not cold and other issues. It will cause an decrease in efficiency in your air-conditioning system and lead to higher energy bill. Other than that, the chances of your units experiencing malfunctioned parts or sudden breakdowns will be higher which means you may need to pay for the hefty repair cost in the future. If you are looking for maintenance servicing contract for your company, you can contact or email us your enquiry. When comparing the price of aircon servicing maintenance contract and general aircon servicing, the cost will be cheaper of servicing contract will be cheaper. Thus, by signing up for our aircon maintenance contract, you will save on your regular maintenance cost over time while having your air-conditioners regularly serviced and maintained by professionals. If you would like to sign an air-conditioning maintenance servicing contract with us or find out about our servicing contract price, you can contact our friendly staff and we will provide assistance on your aircon needs. Why Opt for Aircon Maintenance Contract? By having yearly aircon maintenance servicing contract in Singapore, it will ensure that your air-conditioners are properly taken care and maintained by professionals. During the maintenance, our staff will ensure that your units is operating properly and ensure that your units is in good working condition. Other than that, during regular maintenance, our staff will perform regular checks on your air-conditioning system and this will allow us to detect potential problems in your units. In addition, our staff will check if there are any parts worn out or malfunctioned. This allow the parts or problem to be repaired or resolved in time which will prevent worsening of the issue and save on hefty repair cost. Furthermore, by opting our maintenance contract, this will give you a piece of mind as you know that your air-conditioner is in good hand by professionals. This will make you hassle-free as you do not need to worry about your units. We will handle and take proper care of your units while you sit back and relax the cooling air. In our air-conditioning maintenance contract, there are many benefits such as improve operating an cooling efficiency, remove dirt and dust, cleaner and fresher air, reduce possibility of breakdowns and most importantly, it help to save on your overall servicing maintenance cost. Hence, when you opt for our aircon servicing maintenance contract, we will perform regular maintenance and checking on your air-conditioner. We will ensure that your air-conditioning system is in good working condition, provide advice on any issues detected and provide the best solution to rectify it. If you like to find out more on our regular air-conditioner maintenance, you can call our friendly staff.